Before the film Risen (2016) there was the Oscar Award-winning film The Robe (1953) in which Richard Burton played the fictional Roman Tribune, Marcellus, a soldier present at Jesus’crucifixionwho becomes a believer. In Kevin Reynolds' film Risen Joseph Fiennes plays a Roman Tribune, Clavius, who is present at the crucifixion of Jesus (Cliff Curtis) and then must come to terms with who Jesus is based on hard evidence. Like The Robe's Marcellus the Roman Tribune Clavius is fictional but the majority of the characters he engages are based in the Biblical account of the life, death, resurrection and ascension of Jesus, who is called by the Hebraic name “Yeshua” throughout the film. Set between the day of Jesus' crucifixion and His ascension 40 days later, Risen is not a film made by an atheist bent on disproving Christianity. It is respectful of the Christian faith while at the same time considers what a non-believer would have to "reconcile" should they have come in contact with the risen Jesus. 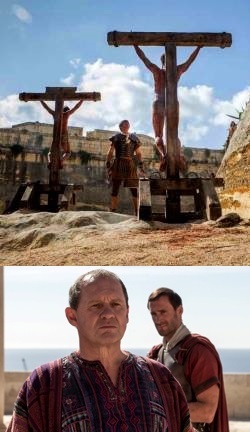 Following the events of Easter morning, Pontius Pilate (Peter Firth) tasks Clavius with finding the missing body of Jesus to satisfy the Jewish High Priest Caiaphas (Stephen Greif) who fears that Jesus' disciples have takenthe dead body so they can claim the resurrection Jesus had foretold about Himself. Clavius is presented as a reasonable man going about solving a mystery like a modern-day detective. Does Clavius find Jesus' body? As shown in the film's trailer, he finds Jesus’ body, however it is not dead. In a letter to Pilate, Clavius writes, "I have seen two things which cannot reconcile: A man dead without question, and that same man alive again." The idea of a Roman soldier becoming a Christian or at least grappling with the Christian faith isn't new; Hollywood has long history of fascination with the soldiers who crucified Jesus. 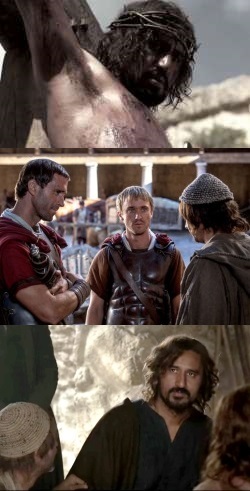 Sometimes they are brutal and sadistic as depicted in Mel Gibson's The Passion of the Christ (2004); sometimes they are conflicted like the Centurion Cornelius in the recent television mini-series A.D. The Bible Continues (2015) which told the highly-fictionalized story of a real Roman centurion's eventual conversion to the Christian faith (Acts 10). John Wayne famously played a centurion at the foot of the cross in The Greatest Story Ever Told (1965) with the equally famous line concerning Jesus: "Truly, this man was the son of God." It's clear that a combination of John Wayne and Richard Burton provided partial inspiration for the Coen Brothers' recent film Hail, Caesar! (2016) in which George Clooney plays yet another Roman solider at the foot of the cross. The question then is: Does Risen add anything to the long list of projects that focus on these Roman soldiers or is it simply derivative? Thankfully Risen gives audiences something new. First, by mixing the religious-sword-and-sandal-biblical-epic with the modern crime-solving genre the film shows some originality in its approach. Second, by giving the audience the character Clavius, Reynolds adds a twist to the stock Roman soldier character. While the film invites viewers to put themselves in Clavius' sandals, just as in The Robe with Richard Burton, the addition of the soldier’s detective work for Pilate makes it feel more fresh. Clavius' spiritual yet sceptical detective character efficiently operates as the audience’s entry point into the Biblical story. Additionally, Risen provides some needed originality by setting the film between Good Friday and the day of Jesus' ascension. Apart from films like Son of God (2014) most films dealing with the crucifixion, like The Passion of the Christ, tell little about the resurrection or provide no mention at all. Here too Risen is set apart from the crowd as Reynolds takes viewers from the foot of the cross to the ascension. Another area where writer/director Reynolds shows some originality is the careful depiction of the Romans as religious people who are not without some understanding of what Jewish people believe. The Romans portrayed by Reynolds are not agnostics or atheists. Clavius’ faith is in Mars the Roman god of war. 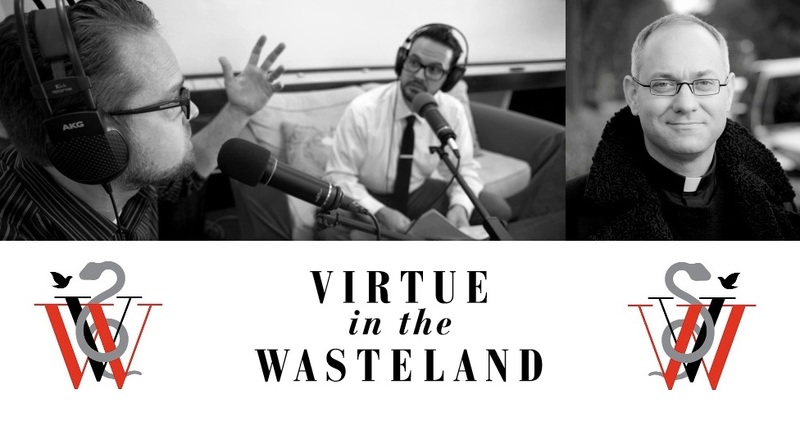 In a conversation with Pilate early in the film he says he prays exclusively to Mars to which Pilate responds saying he prays to the Roman god Minerva for wisdom. While the Bible provides no details concerning Pilate’s prayer life, this fictional detail referring to his need for wisdom points back to Jesus' trial which the film only references through dialogue. During the same conversation about prayer, while acknowledging Clavius' ambitions, Pilate asks him what he wants in life. Clavius’ hopes include a position in Rome, eventually a home in the countryside, a family, and a day without killing, a time of peace. By the film’s end Clavius faces a choice: does he believe the peace he seeks will be granted to him by Mars the Roman god of war or by Yeshua, the only Son of the Jewish God Yahweh who he has witnessed arisen from the dead. Right up until the final frames of the film viewers are left to wonder what Clavius will do with the facts before him. Will he believe in Yahweh and the Messiah Jesus or will he continue serving the god Mars and Rome? Will Reynolds leave it an open question? Is Risen a flawless religious epic? No. Joseph Fiennes, who has played William Shakespeare in Shakespeare in Love (1998) and Martin Luther in Luther (2003), turns in a good performance as Clavius, as does Peter Firth as Pontius Pilate. Aside from them the acting is uneven. With Risen Reynolds, who directed films like Robin Hood: Prince of Thieves (1991), Waterworld (1995), and The Count of Monte Cristo (2002), creates a film that's better than Waterworld but not as well crafted as his The Count of Monte Cristo. It is, however, much better than Son of God the theatrical retread from the Roma Downey and Mark Burnett TV mini-series The Bible (2013). 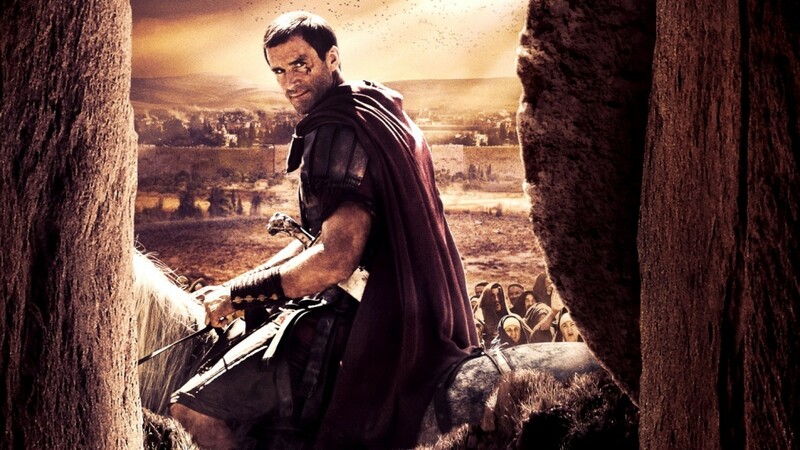 Apart from the film’s fictional characters and events how does Risen do Biblically? Here viewers will want to watch carefully as there are some details that will likely jump out. For instance, Mary Magdalene (María Botto) is portrayed as having been a prostitute.While this is a common idea it isn't definitively Biblical and only gained a foothold in western Christianity during the Medieval period. Also, while the Gospels talk about Jesus’ linen burial shroud, they make no mention of an image appearing on the shroud following His resurrection. Risen shows the empty shroud to have an image that looks like the image found on the Shroud of Turin. These moments of creative license may run afoul of some viewers. When it comes to the characterizations of the disciples Risen ends up largely sidestepping their three years with Jesus prior to His death and resurrection. Rather than reflecting the depth and richness found in the Biblical account, they are instead portrayed as holy fools who don’t appear to have received three years of intense education in the company of Jesus. Whereas Peter (Stewart Scudamore) could have talked to Clavius about Jesus' transfiguration, or walking to them on the Sea of Galilee, or of his own confession of Jesus being the Christ, the Son of the Living God before Jesus' death and resurrection–a confession now proven in the risen Christ– instead he is depicted as someone who has not, on the day of Easter, had his mind opened by Jesus to understand the Scriptures concerning the Messiah (Luke 24:45). Had Reynolds taken this into account the characterization of the disciples could have been more compelling. Where the film gains much higher marks is in fully embracing a risen Christ Jesus and the conviction of the remaining disciples who no longer fear death after their encounters with Jesus following the resurrection. Bartholomew (Stephen Hagan) is particularly honest, even if he comes across as the biggest fool. In a more tempered moment, when asked if the disciples knew Jesus would rise from the dead, Bartholomew joyfully says, "He told us He would, but in truth we doubted." While Risen–which was produced in part by AFFIRMFilms a division of SONY PICTURES which has recently produced a stream of films aimed at Evangelicals like Moms' Night Out (2014), Courageous (2011) and Fireproof (2008) –will not satisfy every viewer, it is a semi-secularly-produced religious film that deals with doubt and faith in an even-handed positive way. Like Hail Caesar!it treats Christianity fairly. There is no hard edge of cynicism which characterizes films like Martin Scorsese's The Last Temptation of Christ (1988), Denys Arcand's Jesus of Montreal (1989), or Monty Python’s Life of Brian (1979). It's true strength may come in its “approachableness.” Risen will appeal to viewers who enjoy crime mysteries, detective work, and history and those who would be less likely to watch something like Son of God or The Robe. Will Risen win Reynolds any Oscars? Not likely, but for all its flaws it provides an accessible film in which Jesus is both mysterious and approachable. It's the kind of movie that invites Christian viewers to contemplate the nature of conversion in a personal way. It asks the valuable question, "What is it like to be moved from having no faith in Jesus to being a Christian?" This is an introspective layer many religious films fail to embrace.